Signing is a powerful tool for behavior management in the classroom. It allows silent cues to communicate with students. Signing Time is the only early learning system to combine the power of music and sign language to create exceptional learning experiences for children from birth through elementary school. Research shows that signing in the classroom can build vocabulary and enhance social interaction for students of all abilities. Learn more about signing in childcare and preschool. Learn more about signing in the classroom K-6. Learn more about signing in homeschool. I teach in a special needs classroom. We incorporate Signing Time into our daily routine. I love Signing Time because it not only helps with communication, but also introduces vocabulary and sight words. My students absolutely love the videos and do not even realize that they are learning while they watch. Thank you so much for these wonderful videos. What sign language curriculum is available for child care centers and preschools? The Baby Signing Time Preschool and Childcare Program is based on the award-winning Baby Sign Language System, Baby Signing Time, and contains fun-filled lessons and activities for infants, toddlers, and pre-schoolers, plus teacher guides and more. Signing with young children will help you be a more effective teacher – and bring an element of fun to your daily routines and lesson plans. When signs are used in your infant and toddler program, or preschool center, there are fewer incidents of tantrums, hitting, biting, and other types of aggression. In addition to creating more peaceful learning environments, signing helps you address the learning styles of all the children in your care. When signs and words are used together, auditory learners hear the word, visual learners see the sign, and kinesthetic learners can use their hands to make the sign. What sign language curriculum is available for K-6 classrooms? 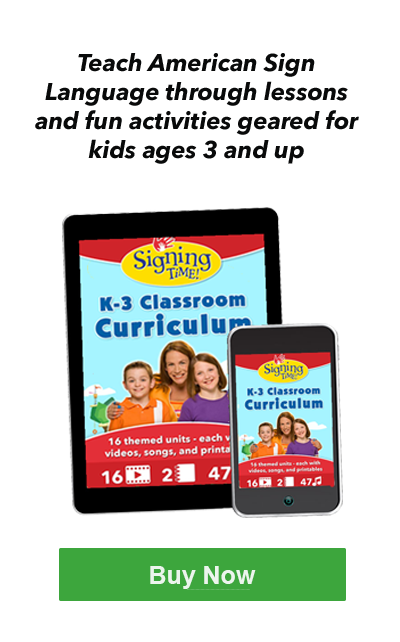 Signing Time Classroom Edition brings American Sign Language (ASL) into the classroom. Teaching ASL helps students become more engaged in learning in all areas. Signing involves physical movement, which adds a kinesthetic element to learning. This physical movement engages students’ bodies as well as their brains, giving them a more intensive and multi-sensory learning experience. In addition, the physical involvement in learning pays off. Studies show that when words are presented orally, visually, and kinesthetically (through sign language), students’ scores on vocabulary tests are significantly higher than their non-signing peers. Signing is a powerful tool for behavior management in the classroom. Sign language requires eye contact, which automatically helps draw students’ attention to the teacher. When teachers use signs to cue transitions and new activities, students will be prepared to look and listen for new directions. Signing with students while they line up helps them stay actively engaged – and quiet – as they move through the hallways. Teachers who sign in their classrooms report that signing helps create a more harmonious environment. What sign language curriculums are available for homeschool? One of the biggest challenges that homeschooling parents face is finding teaching resources that will meet their child’s learning needs and effectively address those needs over time. Teaching American Sign Language gives your child(ren) the building blocks of a second language. Signing meets the needs of visual, auditory, and kinesthetic/tactile learners. Signing Time resources provide a rich, multi-sensory experience to target a wide range of learning styles and preferences. 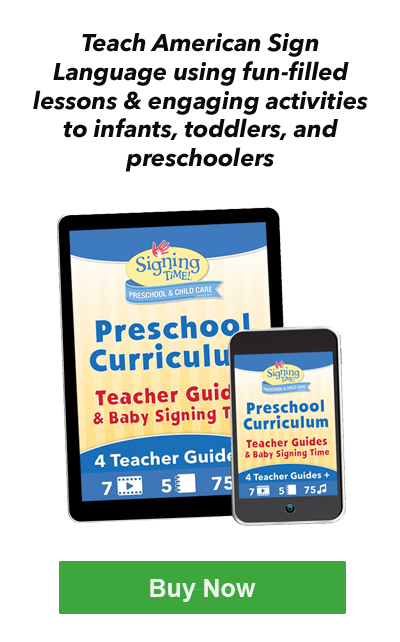 Signing Time has a complete library of educational materials, including videos, songs, flash cards, board books, activity guides. These diverse resources give you a wide range of teaching options, so you can present material in the way that works best for you. How do I use signs to teach science? Signing supports visual, auditory, AND kinesthetic learning. 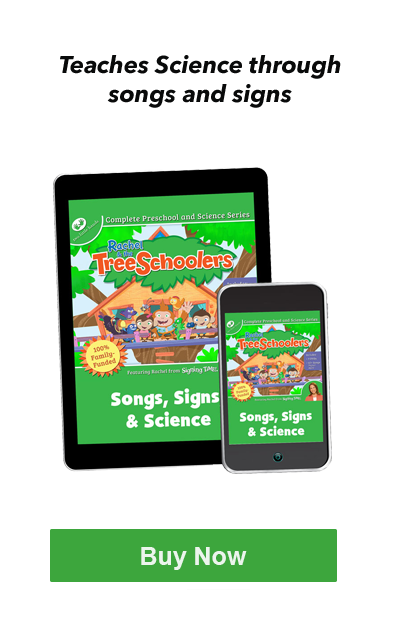 Rachel & the TreeSchoolers incorporates the best elements of Schoolhouse Rock, Mr. Rogers and Sesame Street to deliver a well-rounded preschool science curriculum for ages 2-6. Teach SCIENCE with songs and sign language. Rachel & the TreeSchoolers introduces foundational science concepts in a way your students will never forget. This series teaches kids about seasons and weather, plants and photosynthesis, animals and habitats, health and safety, earth science, and much, much more! lets your child go to preschool with Rachel from Signing Time! What sign language curriculum do I use with older children? 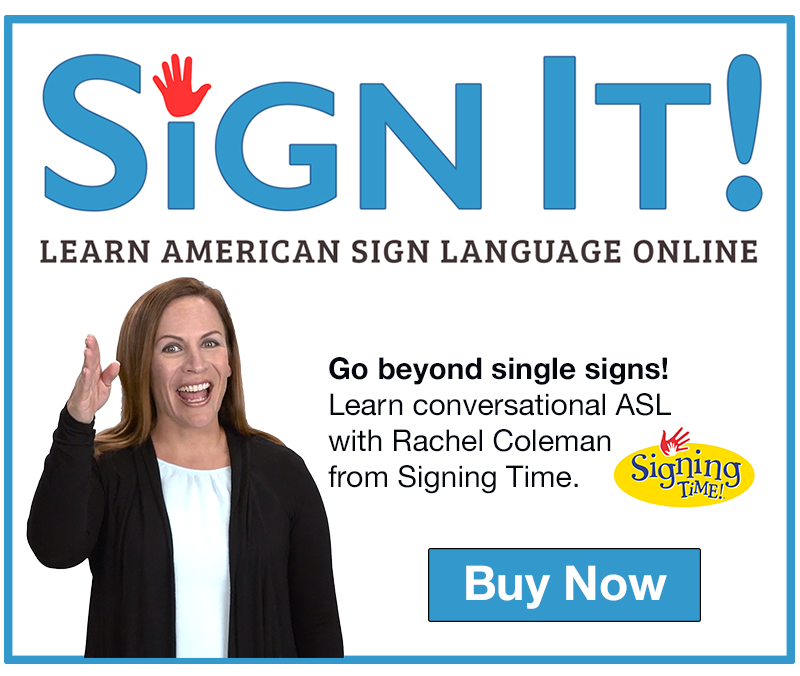 Sign It ASL is ideal for kids 8+ and adults with an interest in learning beginning sign language. These online classes teach ASL vocabulary, phrases, sentences, grammar, Deaf culture, and much more from this online ASL curriculum. This course features many ASL professionals including the stars of Signing Time (Alex, Leah and Rachel Coleman), ASL comedian Keith Wann, and numerous well-known Deaf actors and educators (including Peter Cook, Crom Saunders, Alexandria Wailes, Maleni Chaitoo, Sean Forbes, and Manny Hernandez). Still have questions? Learn more!